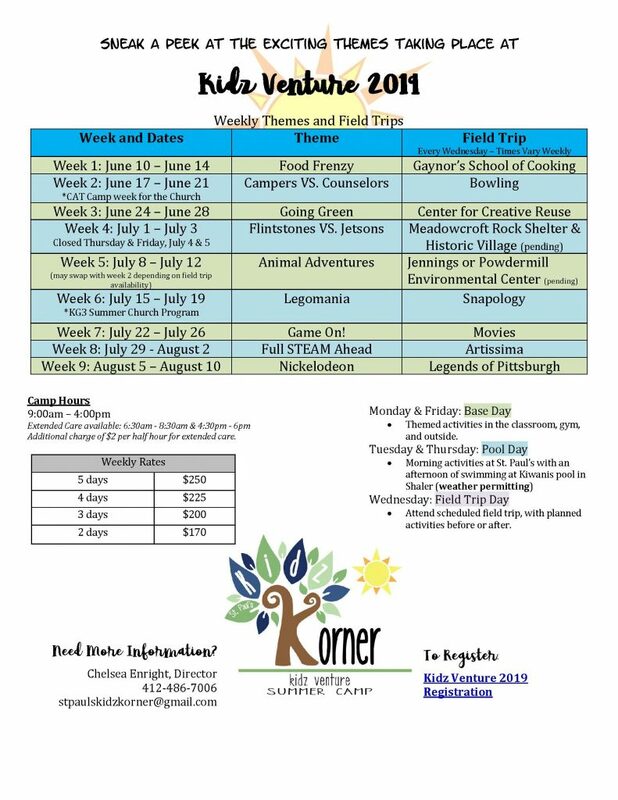 Kidz Korner: Kidz Venture is an eight to nine-week summer camp program for children entering 1st – 6th grade. We offer a safe place for children to play, learn and explore Pittsburgh’s special places. The summer will include weekly field trips, swimming, and meals as well as exciting recreational activities planned around each week’s theme. In addition to arts, STEM, and physical challenges, children will have the opportunity to collaborate with each other and camp counselors to create camp rules, participate in service projects and gain leadership skills. We plan each day carefully to find a balance between free choice time and guided activities as well as active and calmer times of the day. Camp is limited to 60 children daily. Weekly reservations are required to insure available space for participation. Once camp reaches full capacity attendance can be restricted. Please pre-arrange your scheduling. Kidz Korner will reopen for our school year programs on Thursday, August 22nd offering full day care to those children enrolled in school year before and after school care or kindergarten enrichment at districts that have not yet gone back. The summer key fob fee is $15.00 at registration for families who do not already have one;$10.00 will be refunded when the fob is returned on the last day of participation. The weekly rates are determined based on the number of days scheduled to attend. Invoices will be emailed each Monday and are due by the Friday following bill disbursement. Failure to pay on time will result in late fees and possible suspension from the program. Upon completing the on-line registration additional paperwork will be e-mailed to you. All paper work must be returned for registration to be complete.